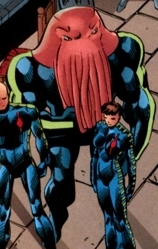 NOTE: Squid created by Erik Larsen, with help from Keith Giffen and Victor Bridges. Manga was part of a Covenant of the Sword strike team that was created by the Creator on their behalf. They were ordered to eliminate SuperPatriot but their intended target was assisted by Freak Force in apprehending the villains. Squid was incarcerated in the M.M.M.S. until he was liberated by Freak Force and Chelsea Nirvana’s army. Chelsea led her army to seize control of the Vicious Circle during the Gang War but was soon defeated by CyberFace. Squid was amongst the freaks then inducted into the Vicious Circle where he served for many years. He was one of those villains that was sent by Horde to eliminate Dragon, only to be shrunk by a Martian weapon which left him in a miniaturised state for a couple of years. Some time later, Squid was reunited with his original unit who joined forces to liberate the Creator from Stronghold Penitentiary. These criminals were confronted by a newly reformed Freak Force. Unfortunately for them, the Billy Berman Mighty Man was amongst the heroes and he massacred all of their opponents.